On June 8, 2015, NASA launched a saucer-shaped vehicle into the atmosphere, to test technologies that will enable larger payloads to safely land on the surface of Mars. 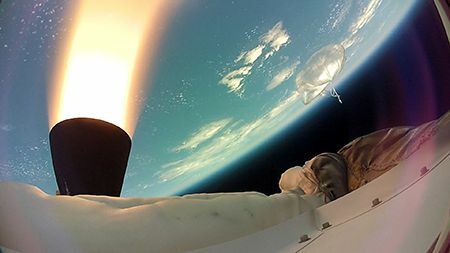 Conducted over the Pacific Ocean, the Low-Density Supersonic Decelerator (LDSD) flight simulated supersonic entry and descent speeds at which the spacecraft would be traveling through the Mars atmosphere. As NASA is planning to send astronauts to Mars in the 2030s, this technology is essential to landing heavy payloads on its surface. This flight marked NASA’s second test for the two technologies designed to considerably slow payloads as they enter the Mars atmosphere. The first, an inflatable Kevlar tube called the Supersonic Inflatable Aerodynamic Decelerator and the second, a large parachute known as the Supersonic Ring Sail Parachute. Orbital ATK's work on the LDSD test spanned the breadth of the company’s many resources. Under contract with NASA’s Jet Propulsion Laboratory (JPL), which led the test, Orbital ATK’s Space Components Division facility in San Diego, California designed, built and tested the Composite Structure Assembly (CSA), the composite structure that houses the two braking devices central to the test. The Orbital ATK site in Pasadena, Calif. provided engineering services to JPL including the design and installation of the cabling used for the flight test hardware. In addition to the test unit structure, the company’s Technical Services Division (TSD) oversaw the preparation and administration of the test unit’s balloon launch, supplied the flight computer, inertial measurement unit, and key avionics. This work is performed under contract with NASA's Wallops Flight Facility in Wallops Island, Virginia. The company also supplied 18 sounding rockets for gathering meteorological data while working as a subcontractor to NASA through the Atmospheric Technology Services Company. Speeding through the same altitude region traveled by the LDSD vehicle, the small sounding rockets will collect on-site data in an atmosphere similar to Mars. "Orbital ATK's integrated products for this test flight demonstrate the latest, cutting edge technology from across multiple facilities around the country," said Frank Culbertson, President of Orbital ATK's Space Systems Group. "NASA's future missions to Mars will benefit from the scope and scale of Orbital ATK's highly engineered products and affordable innovation." This image was taken during a "hang-angle" measurement, in which engineers set the vehicle's rocket motor to the appropriate angle for the high-altitude test. The nozzle and the lower half of the Star-48 solid rocket motor are the dark objects seen in the middle of the image below the saucer. (Photo courtesy of NASA/JPL-Caltech). The June 2015 test flight mirrored one conducted last year, and Orbital ATK’s work on the core structure of this project actually began back in early 2012. Despite an evolving design, the first unit was built in an amazingly short 16 weeks. Complete static load testing of the structure followed and the first unit was delivered to NASA in December 2013 and flew in July 2014. The CSA was built to accommodate all of the vehicle sub-systems into a single, integrated structure. Every compartment panel and pass-through had to be designed into the unit. So, this very unique structure was built to some equally unique specifications. It needed to be lightweight as the final structure is only about 15% of the total test unit weight, but it also needed to be very strong. The load generated by the parachute was estimated at about 50,000 lbs across many connection points. Another challenge was that it needed to float. Accommodating the parachute inflation loads was also a challenge. Upon inflation, the parachute imparts in excess of 50,000 pounds of force at each of its three attachment points. A design that could handle this load, and meet all other spacecraft requirements, involved the use of unique composite materials and sophisticated fitting designs. Because of the criticality of this aspect of the design, SCD built and tested a complete sub-section representation of one parachute attachment location. The sub-section weighed approximately 100 pounds, but supported over 100,000 pounds of load in test, giving the team high confidence in the fidelity of the flight design. This image shows the balloon that lofts the LDSD test vechicle as it was released from the launch tower. (Photo courtesy of NASA/JPL-Caltech). In order to get the CSA to the proper altitude for the LDSD test, JPL looked to the Orbital ATK team from the Columbia Scientific Balloon Facility (CSBF) to provide the balloon launch services and flight computer. Similar balloons are routinely used for launching scientific instruments weighing thousands of pounds to altitudes up to 130,000 feet for durations lasting from a few hours to more than a month, from sites all around the world. 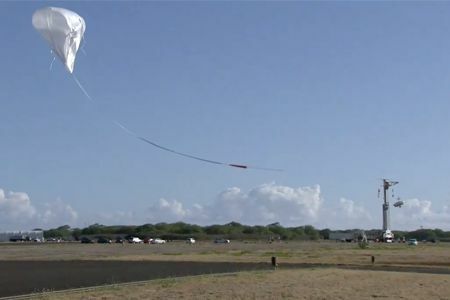 For this test, the LDSD vehicle and 34.4-million-cubic-foot scientific balloon were released from a first-of-its-kind launch tower, for its ascent to nearly 120,000 feet. Typically, a large mobile vehicle holds the science payload and is driven to align the payload under the balloon at launch. Because the LDSD test vehicle contains an Orbital ATK STAR™ 48B solid rocket motor, a unique remote-operated static launch tower was built to keep personnel clear of the test vehicle at launch. Following its release from the tower and once at the proper altitude, the supersonic test vehicle successfully dropped away from the balloon and the Orbital ATK STAR 48B motor ignited to accelerate it to a velocity of more than Mach 4 climbing to over 180,000 feet. The scenario simulated conditions experienced by payloads falling though Mars’ thin atmosphere. Rockets fire in this video clip captured by the test vehicle for NASA's Low-Density Supersonic Decelerator project last year. (Photo courtesy of NASA/JPL-Caltech). With its perfect record on more than 2,440 flights the Orbital ATK STAR 48 has the reliability needed to help ensure success, as well as more than enough power to do the job. In fact, the same motor set a record for the fastest spacecraft ever to leave Earth when, in 2006, the New Horizons spacecraft was launched into space to study the dwarf planet Pluto. Orbital ATK’s 48B third-stage imparted enough velocity to push the spacecraft to approximately 36,000 miles per hour, breaking its own record of 34,134 miles per hour on the Ulysses spacecraft in 1990. Fortunately, the STAR 48 also offers a high degree of flexibility. 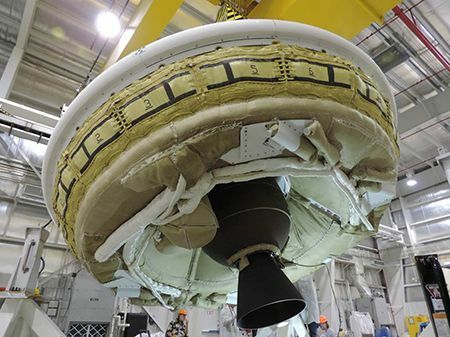 To reduce the amount of impulse required for the LDSD test, the Elkton team off-loaded roughly 20 percent of the propellant grain used in the standard configuration -- the maximum amount that can be removed without the need for requalification. For more information about the LDSD test, visit http://www.nasa.gov/mission_pages/tdm/ldsd/index.html.